New York.- The Onassis Cultural Center presents Giorgio de Chirico and Greece: Voyage through Memory, an exhibition of works by major European artist Giorgio de Chirico, opening on October 31, 2007. Organized by the Giorgio and Isa de Chirico Foundation in Rome and the Athinais Cultural Centre in Athens, this presentation of 35 of the artistʼs metaphysical paintings and sculptures, as well as 22 drawings and lithographs are drawn from the artistʼs late period of work. Throughout his life de Chirico maintained a personal and academic interest in Hellenic culture. Born in Volos, Greece in 1888 to Italian parents, he went on to study at the Athens Polytechnic and the Academy of Fine Arts in Munich. His debut in the art world took place in Paris in 1912. Most commonly known for having inspired Surrealism, de Chiricoʼs work also adopted Neo-Baroque influences. His bond with ancient Greece harmonized with his appreciation of classical Italian art. The extremely innovate imagery of the 35 paintings and sculptures featured evoke the artistʼs memories and reveal his poetic vision, demonstrating the inspiration he found in both cultures as well as his role in defining a different, modern reality. Voyage through Memory presents his artistic reflections on Greek tradition, history, philosophy and aesthetics, fitting the Onassis Cultural Centerʼs mission to engage and educate the public about the universal ideals of Greek civilization. It is said that de Chiricoʼs first painting was inspired by the horses he saw in his birthplace of Volos. The focus of horses later developed into a recurring theme for the artist, represented in the exhibition by the painting The Painter of Horses and his Ancient Horses, a bronze sculpture of horses standing in the wind. De Chirico was profoundly influenced by Greek mythology, of which he portrayed the Argonauts, Titans, Centaurs and Olympian Gods. De Chiricoʼs neometaphysical work is another important exhibition theme and is exemplified by paintings such as Harmony of Solitude and The Tower as well as the sculpture The Great Metaphysician, creations which evoke the mystery of space and time in the unique environment he created. Giorgio de Chirico and Greece: Voyage through Memory, curated by art critic and theorist Takis Mavrotas, it was originally presented at the Athinais Cultural Centre in Athens, Greece. Other highlighted works include View of Athens, The Painter, Two Horses Against a Marine Background, Hebdomeros, The Lonely Poet, and The Hand of God and the Nine Muses. The Onassis Cultural Center is located in the Olympic Tower (645 Fifth Avenue – entrances on 51st and 52nd Streets). Giorgio de Chirico and Greece: Voyage through Memory will be on view October 31, 2007 – January 6, 2008, Monday – Saturday from 10 a.m. – 6 p.m. Admission is free. The Onassis Cultural Center is the public forum of the Onassis Foundation (USA), an Affiliate of the Alexander S. Onassis Public Benefit Foundation founded by Greek shipping magnate Aristotle Onassis upon his death in 1975. 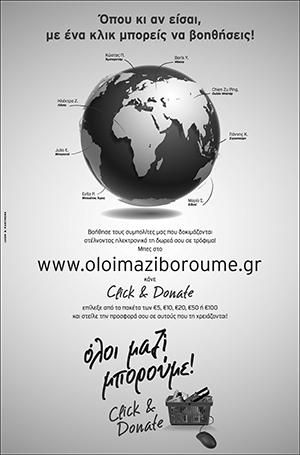 The Onassis Foundation (USA) aims to promote, preserve, and celebrate Hellenic culture of all time periods in the United States. The Center seeks to give the public greater access to significant aspects of Greek culture through its ongoing series of exhibitions, lectures, musical events, literary evenings, and theatrical performances.